At last I have obtained a copy of Cheetah’s new Sound Sampler. This is a music add-on for the Spectrum; like its predecessor, the SpecDrum, the new gadget promises to be great fun for non-musicians as well as budding pop stars. Sound sampling is a simple idea. Like a cine camera taking pictures very quickly, a sound sampler tests the volume of a sound literally tens of thousands of times a second, and stores the result as a stream of numbers in computer memory. The numbers can later be ‘played back’ through an interface and loudspeaker, reproducing the original sound. The faster you can read numbers, and the more accurately you can measure volume, the better the sound quality. Good compact disc players can recognise 65,536 volume levels about 40,000 times a second; if it wasn’t for the limitations of the recording equipment — ultimately, the microphones and pickups — this would sound just like the real thing. Cheetah’s sampler can discern 256 levels 35,000 times a second, so the sound quality is a little rough and distorted, but has quite a wide tonal range. The first pre-production unit I tested crackled badly, but Cheetah have convinced me that this was a random fault on that hand-built prototype — the second unit worked fine. A similar sampler, made-to-measure for musicians on a budget, would cost about £200 and you couldn’t play games on it! A sound sampler can do many things that a tape cannot, as anyone who has heard Paul Hardcastle’s NuNuNuNineteen hit will realise. In fact that record only contains a tiny fraction of the repertoire of a good sampler. And it’s easy. And it’s fun, for anyone remotely interested in music. Almost everyone has musical ideas. Whether you hum, clap or tap biros on a desk you probably make your own music from time to time. But, until quite recently, you couldn’t produce ‘real’ music that way. It took years of practice and training to be able to get ‘musical’ results out of the clumsy, tangled machines we call musical instruments. It was boring, especially if you were forced to play other people’s music while learning. Few people started to learn; most of them gave up. The world is full of people with musical ideas who can’t express them. Yet. There is a new revolution, happening in music. For the first time ordinary people are discovering that they can make music acceptable to themselves and to many others — without having to master the techniques of music or of playing an instrument. Once a sound has been stored in a computer it can be modified in a virtually infinite number of ways; all you need is appropriate software. Of course, older technology lets you alter sounds too, but the computer allows changes to be recorded, replayed, tweaked, and tested in a totally reliable, repeatable way. Like other HiTech revolutions before it, the computer revolution in music will not create anything new, but it will give everyone access to an ability that previously was only available to a trained few. The Cheetah Sound Sampler is an important step towards this new musical world. It’s not a revolution in itself, but it is a sign of the times, which is why I have spent a few paragraphs explaining what is going on. This review will be from the point of view of a non-musician. Professional Muso Jon Bates will add his comments next month. 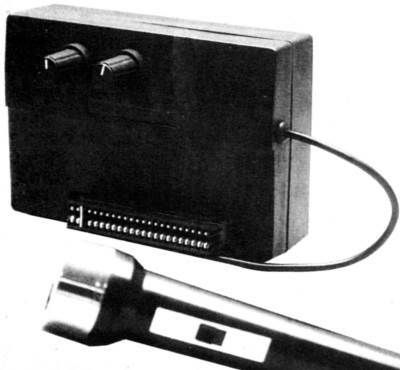 £44.95 gets you a cardboard box containing a microphone, interface unit, tape and manual. The microphone appears to have come from a cheap cassette recorder — there’s even a tape-stop switch, although the sampler makes no use of this. The quality of the microphone is adequate, but it you’ve got a better one, use it. The interface plugs into the edge connector at the back of your computer. There’s no through port, so you can’t plug anything into the back of the sampler. Two control knobs point back towards the Spectrum; you’ll need some kind of bus extender if you want to use this interface with a deep add-on keyboard such as a Fuller FDS. There’s a 3.5mm input socket on one side of the box and a trailing output lead, ending in a phono plug, on the other side. This plugs into your amplifier or HiFi, so that you can hear what you’re doing. The electronics look well designed, although some of the soldering was a bit dodgy on the prototypes I examined. Cheetah have used standard Ferranti chips, with a metal ‘ground plane’ on the board to reduce interference from the computer. Port 127 is used for input and output. You must access port 191 — the strobe — at least seven microseconds before you read a sample, to trigger the analogue to digital converter. The tape is the most important part of the package — software determines the power of any computer-controlled musical device. One side of the tape holds two programs — the Sampler and the Sound Utilities. On the other side you find Samples — data recordings of the sound of an organ, glass breaking, bells, a handclap, and speech. There are no back-up recordings on the tape, but fortunately the files are easily copied; they’re useless without the interface, of course. The manual is a twelve-page cassette-sized booklet. The blue type is very small, but readable. The text is interesting to read, but a little chaotic in organisation. There are a few Hints and Tips, but not enough. For more, read on! The sampler loads from cassette in 2 minutes 40 seconds. After the first part loads you must stop the tape and indicate whether or not you want to transfer everything to Microdrive. This gets irritating if you’ve only got tapes, although it is good to see that Cheetah are supporting the Microdrive. The program also allows you to use the 128’s extra memory to store samples — hooray! Your first step should be to set the input level. I tested the sampler successfully with microphones, a guitar, synth, cassette and compact disk. In each case you connect the device to the small socket on the left of the sampler, select the ‘Set Level’ option, and play some music or make a noise. The graph of the sound appears on the screen. The display is re-drawn every second, and looks quite pretty. You must adjust the input level — the left hand knob — until the graph fills most of the display without running into the top or bottom edge. That indicates an overload, which would cause a distorted recording. Once you’ve set the level you can use the sample menu. A standard Spectrum can record about a second of good quality sound — or two seconds at ‘half speed’, which gives a duller tone. Spectrum 128 owners can record for up to six seconds — sampling uses up RAM at a prodigious rate. Memory is divided into small units and you can split these between named samples as you wish. It’s a good idea to keep the sample names short, as the software asks you for them rather persistently. Beware: the program does not complain if you use the same name for more than one sample. Once you’ve decided the length and speed of a sample you can start recording under manual or automatic control. Manual recordings begin when you press a key; automatic ones start as soon as the input signal reaches a fairly high level. Immediately after recording you can hear what’s stored by using the ‘List Samples’ option, which displays the name and length of stored sounds, playing them back as they are listed. Configuring a sound in the Cheetah Sampler’s edit section... This is what “OY CAM” sounds like! To get full control you must use the ‘Edit’ sub-menu. This lets you combine, copy, reverse, or delete samples by name. Most importantly, you can ‘configure’ a sound. This is a powerful but rather fiddly process. The idea is to put down four markers, which between them allow you to stretch sounds and get distinctive “NuNuNuNineteen” effects. As you configure a sound, each unit of the recording is displayed as a graph on the screen. You can move to any point in the sound and position markers on the graph at that point. The graph corresponds directly to the sound, so you can spot the key points by eye with a little practice. It takes a while to learn to do this, but the final version of the software allows you to replay the sound up to and from the current point, which makes it easy to find your way around by ear. The four markers must be arranged in order. The first one indicates the point where you want replay to begin. The sound is replayed from there, past the second marker, and up to the third. If the control key is still held down, the sound between the second and third markers is repeated. Otherwise the rest of the sound — up to the last marker — is replayed, then the computer stops till you press another key. For example, you might sample the word “Cheetah”, putting the first and last markers at either end of the word. If you put the second and third markers around the ‘hee’ part of the word, a long stab at the key would give the sound: “Chee-hee-hee-tah”. If you put those markers nearer the end of the word, you might get “Cheeta-ta-tah”. There was no way to free the unused space at either end of a marked sound on the software I tested. The final version should allow this. Of course, you’re not stuck with speech. You can record screams, crashes, bleeps, creaks, or any other sound. If you can’t afford a synthesiser you can borrow one and sample it, saving the result on tape or Microdrive for future use. Cheetah supply a few pre-recorded samples, but it’s easy to record your own — I lost no time in blasting my neighbours with sampled drum sounds from Cameo’s recent hit The word UP! The playback option is controlled by twelve keys, each corresponding to a different note in a piano-key arrangement. In conjunction with SHIFT you can replay a sample at any one of 24 different pitches, higher or lower than the original. The Art of Noise like to do this sort of thing. Unfortunately the speed of playback changes with the pitch, so it is hard to use musical samples containing more than one beat. Pure notes from other instruments usually sound okay, as you can fill them out by repeating a section. The save and load options seemed to work fine; they allowed you to delete and catalogue Microdrive files, but there was no option to format a new cartridge. The sampler may seem hard to use, and indeed the menu structure is a bit irritating at times, but it’s not long before you can find your way around. From then on it’s f... f... f... fabulous, whether you’re just playing around or trying to get a specific effect. The Sound Sampler contains electronics to read sounds and replay them — and it can do both at the same time, delaying or adjusting the levels to produce an incredible range of effects. 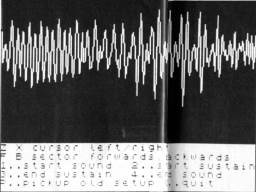 The Sound Utilities are provided by a small machine-code program recorded after the Sampler. Tape loading time is about one minute. The Utilities can process sounds in lots of different ways, and sometimes the names of the options don’t really match up with the effect. Rather than try to analyse what the program is doing, I’ve chosen to describe the sound. Readers who are not familiar with BBC Science Fiction may find some of the analogies a bit puzzling! There’s no level meter in this package, so you must set the input level — the left hand knob — by listening for distortion. All of the effects produce results which you can hear at once, so this is not much of a problem. The main menu lists six options — an Echo Chamber, Reverb Unit, Pitch Shifter, Fuzz Box, Sound Chopper and ‘Bubbleizer’. Most options have one or two ‘slider controls’ associated with them. When an option is selected, the appropriate control keys are displayed until another key is pressed — a nice feature. You can’t use a mouse or a joystick, unfortunately. The Echo Chamber produces a good artificial echo effect, like a Kopykat tape echo machine. It is fun, and good practice for public speaking, to wear headphones and try to talk while a recording of what you said half a second before is played back, full blast. The right hand knob on the interface comes into play here, controlling the extent to which echoes are themselves echoed. Setting this to maximum and using the longest echo you get three or four echoes of each sound, fading over about two seconds, with the last one very quiet and distorted. The minimum echo setting produces the acoustics of a small toilet with a high ceiling. Prehistoric pop-pickers will remember that the Korgis recorded their No.13 hit If I had yoooooo in the loo to get just this sound — now it’s built into your Spectrum! The Reverb Unit is meant to produce a more natural echo. In fact it produces a quite unreal effect. At low settings it adds echo and an interesting tuned Jew’s Harp sound buzzing in time with your voice. I used the microphone with this effect, and the result sounded a bit like a Vogon Laurie Anderson (Oh SuperVogon?). As you increase the setting, the sampler just seems to pick notes randomly from the input — speech remains inflected but is unintelligible once the control is about half way across the scale. At the top setting you just get a pipelike fuzzy wailing tone in time with your voice. The Pitch Shifter could be dedicated to Douglas Adams’ Hitchhikers Guide to the Galaxy since many of the voices from the series are here. The effect is to shift the pitch of the input in a rather unsteady way, up or downwards. At the top of the scale a voice sounds like a Magrathean Mouse. Lower down there are all sorts of voices: ‘Toff’, ‘Brummie’, ‘TV-Voiceover’, ‘Marvin the Paranoid Android’ and a good (?) ‘Vogon’. Use the second control — the ‘duty cycle’ to search for each of the above as you reduce the pitch. There are lots of other effects I can’t describe. The Fuzz Box is rather trivial. Whatever signal is put in, it limits the output to a fixed maximum level. Loud sounds are distorted — the louder, the more distorted. There’s no control — just a ‘quit’ key. Quit. The Sound Chopper seems to be the favorite at Cheetah. Throughout the PCW show, from their position on the balcony, they shouted in imitation Dalek tones as I scuttled around talking to people. The sound chopper produces a very authentic Dalek voice from a human monotone. It works by chopping the sound up and only replaying alternate parts. Slightly slower settings work well on synthesisers and guitars, especially if you use Stereo or mix in a bit of the un-chopped signal. The slowest settings are pretty useless, and the control moves very slowly — the longest chop time is about two thirds of a second, and the slider only moves a small distance every chop. The strangely-spelt Bubbleizer is a new effect invented by Bob Powell of Speedwell Software. Bob designed the Sound Sampler for Cheetah. The Bubbleizer starts out sounding as if a Kazzoo band is playing along with your voice (or whatever else you’re recording). Greater settings add a metallic rasp, and a kind of dripping hollow echo, rising in pitch. After a while the noise becomes abstract, and sounds like a sympathetic Sci-Fi whistling computer; a collection of short, pure tones in time with the input. This gets slower and slower. If you hum, at the maximum setting, the result resembles some kind of alien police siren. The Depth control works painfully slowly here — it takes 40 seconds of ‘auto-repeating’ to move it across the scale. I suspect that this program was included for musicians. In fact it has so many effects that it will probably produce music for anyone who can hum. Instruments — who needs ’em? I looked at two prototype versions of this sampler. The first was abnormally noisy and there were a few ‘rough edges’ in the software, but the problems were irritations rather than major flaws. I’m fairly sure that both hardware and software will be tidied up by the time you read this and Cheetah are in mass production. Cheetah have two more products in the pipeline — a sequencer, which can automatically play tunes made up of sampled sounds, and a mega-clever bi-directional MIDI interface. Datel and RAM Electronics are also addressing this musical market. It’s good that they’re taking Spectrum users with them!